Well, it’s been a long winter and we are so thankful Spring is finally here! We had a few milestones over the course over the winter. The major one was changing our practice location and day to Wednesdays at the ANAF in Barrie. We are so thankful for the partnership we’ve had with the ANAF over the years, and are happy that the tradition continues. 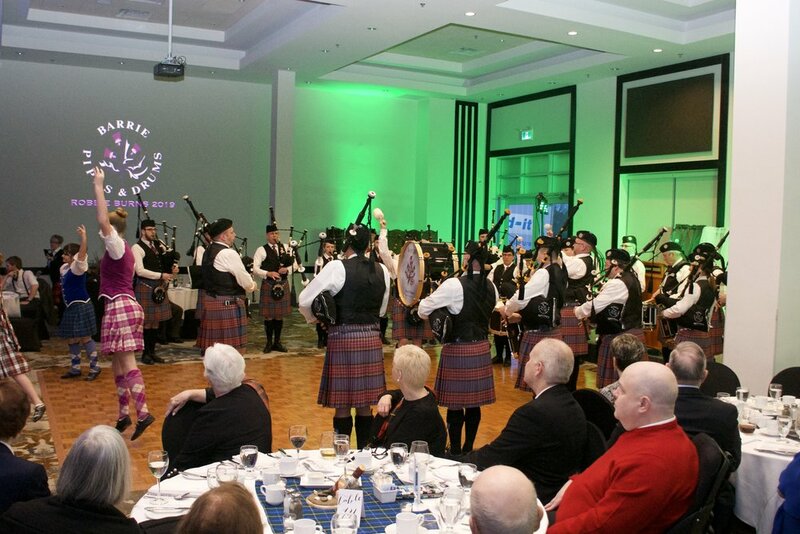 In January, we held our annual Robbie Burns Night at Liberty North. Every year, the community’s support is overwhelming and with over 200 guests in attendance to this year’s event, we are so grateful for all of our supporters. This is our primary fundraiser, and as a non profit organization, we rely heavily on this event, so again, thank you everyone! Shortly after our Robbie Burns Night, we announced that our Grade 4 competition band will be traveling to Antigonish, Nova Scotia in July for the Antigonish Highland Games! We are very excited for this opportunity as it is the organizations first time attending. We will still be competing at most of the Ontario games as well, but we wanted to branch out and who doesn’t love going on a trip?! Keep an eye out on our website within the events listing for the games nearest you, and we hope to see you out this summer! With the competition band in mind, they have been busy practicing and rehearsing for their upcoming season. We are very excited to be back on the competition circuit after taking last season off. That being said, the first competition of the season will be this upcoming Saturday at the Toronto Indoors, held at Moss Park. If you are in the Toronto area, this is a great opportunity to hear solo competitors as well as all level of bands compete. We are looking forward to seeing familiar faces and making new friends this season. We hope you will continue to follow along either on our website, or on either Facebook or Instagram and if you ever see us out and about, make sure you say hi! There’s nothing we love more than connecting with members of the community.